A peculiar and flavorsome recipe for a roasted lamb-shoulder, invented through necessity by Greek bandits who fought Ottoman soldiers. The tale behind the Kleftiko is truly a strange one, click here for the story behind the scenes of this beautiful dish.. This dish is a straight-forward one, there are very small variations with it - a small herb here, a type of liquid there - most of the flavor comes from the lamb-shoulder itself, so choose it carefully and don’t be cheap. In order to produce the effect of buried-under-the-earth-cooking, it is necessary to seal the meat (Unless you have a clay pot that fits all of the ingredients). Use a deep baking dish (23X33X6 cm) and seal it with an aluminum foil (Quite a few recipes use baking paper, I personally do not feel it does the job and therefore would recommend aluminum foil). 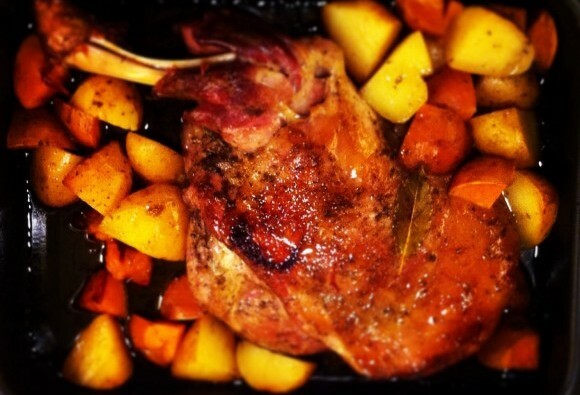 Lamb-shoulder (Lamsschouder in Dutch) can be purchased at any Mediterranean butcher shop (e.g. Moroccan or Turkish shops), ask to leave the fatty parts (they usually separate them in advance) and when you arrive home, wash the shoulder under running water, then dry and store it in the refrigerator. 2-3 hours before you start the cooking, take out the shoulder from the refrigerator and put it in a bowl, so it would warm up to room temperature. Heat up the oven to 170C, put all the root vegetables in a deep bowl. Stir oil, wine, lemon juice and spices together. Add the mixture to the vegetable bowl and mix well. Oil the baking dish and place the shoulder in it, pour the vegetable mixture on the shoulder and arrange evenly over the baking dish. Seal the dish with aluminum foil (quite firmly) and put in the oven for 4 hours. When the 4 hours are over, while opening the foil - you must use caution! Although the scent will be amazing it will also be extremely hot. In order to know if the meat is ready or not, you can check after 4 hours if the meat is “falling off the bone” (to get an idea of how the meat should look like, you can see the attached picture). If it is ready, seal back the foil, put it on an insulated board situated on the table and open it in front of all the guests. Serve with fresh vegetable salad and a strong alcohol. If there is anything left for the day after, do not be disgusted by the layer of fat remaining in the pan - it’s the main flavor of the dish and you should heat it up and serve it over the cooked meat and vegetables. Do not keep it for more than two days in the refrigerator. Wish the Ottomans won’t catch you and that the Kleftiko will warm your belly into the cool night.